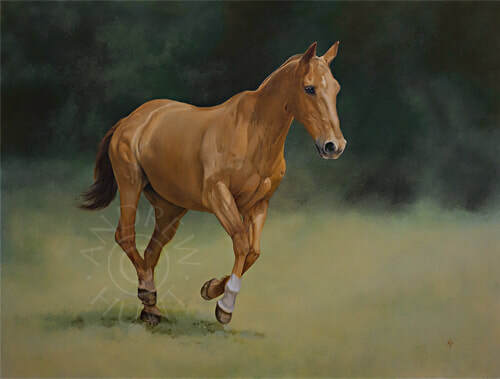 Velcro is a 20 year old, retired polo pony, with a light chestnut coat, standing at 15 hands high. He is so... lovely! Having visited more than a few horses in their paddocks over the years, there are some where you simply don't go in the paddock, and then there are others that I am instantly at ease with - Velcro is one of the latter. Such a lovely temperament. Initial discussion with the client centred around producing a close-up head & neck portrait. However, with useful input from her daughter, Jeanette rightly concluded that a lively, active image would portray his character much better.